RECURRING TASKS - Their recurring tasks are great. There are all kinds of customizations you can use for how often tasks recur. Also, comments on recurring tasks get carried every time the task recurs, so you never forget anything. This was a big reason why we picked ClickUp over other tools. CHROME EXTENSION - I love their chrome extension. I can click a button and create tasks in ClickUp without ever leaving my email, it also puts the email in the task as an attachment. I can also attach emails to tasks, which is great. List Templates - They have list templates, but the due dates get all mixed up whenever you use them. Right now you have to set specific dates and when you create the list using the template, you just set the first start date and all the other dates get moved according to that first date. However, usually I care more about the LAST due date, not the first. Also, they don't skip weekends or anything. I wish there was a way to set the due dates as "Day 1, Day 2" etc. and to have them skip weekends when they are created. Documents and Files - You can easily attach files to tasks or lists, which is great. I would like it if you could also have an area where you could have files that pertain to the whole project, or the whole space, without having to be put in a specific list or task. We were using Asana before we switched to ClickUp. 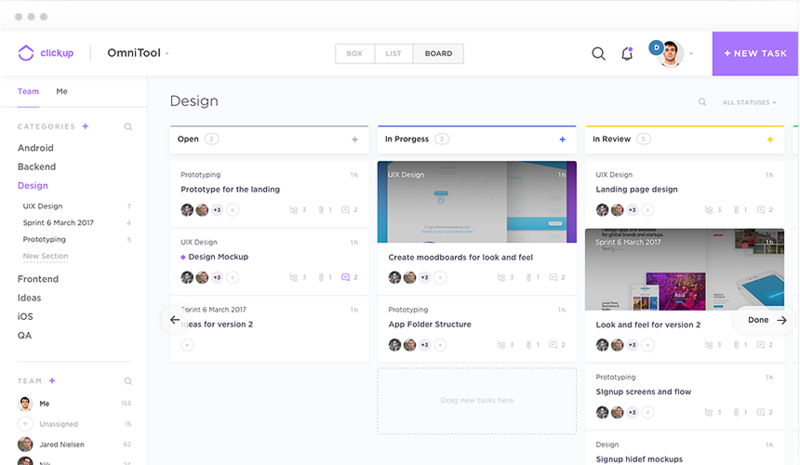 Asana is a nice tool but ClickUp stands out for its better visual appeal and task categorizations.